Ground Penetrating Radar Systems was recently called by an environmental firm to locate any utilities prior to soil boring. The contractor was working within a gas pipeline facility, and risked hitting several utilities. Some of these lines are critical to the operation of the facility, and could have major repair costs, or cause serious injury if they are struck. GPRS, LLC. 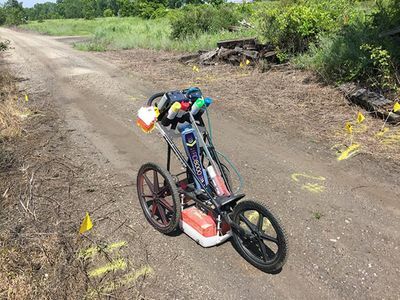 was able to use GPR equipment and Radio Detection to accurately locate and mark out several utilities that would have been struck during the drilling process. GPRS, LLC. was able to get to the job in a timely matter so the project could remain on schedule. GPR is an accurate and effective way of utilities, underground storage tanks, and voids. For more information on how GPRS, LLC. can help you on your next project, please contact Mitch Streight at (614) 400-6889 or by email at mitch.streight@gprsinc.com. We also have the capabilities of locating reinforcing steel, conduits and voids in concrete.